Encaustic painting technology employs a technique utilizing beeswax, pigmented crayons, and a hot iron. The wax crayon is rubbed on the hot iron, and then the iron is used to spread hot wax onto the surface, creating vibrant, structured imagery. 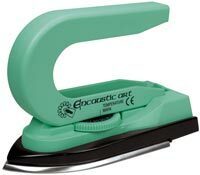 This electric iron has been specially designed for use with encaustic painting.